When I watch TV, and there’s a funny moment, I have two possible responses. Some might consider the second option to be “not laughing.” But here’s the thing, if someone is in the room with me, I’m much more likely to laugh out loud. If I’m alone, I already know it’s funny. So why bother vocalizing it? I’ve noticed lately that I tend to laugh during The Big Bang Theory. Courtesy of the DVR, I watch this as often with someone as I do without. In both cases, I laugh out loud. Have I changed? Is the show just outrageously funny? Or do I laugh just to startle the cat from his couch back slumber? 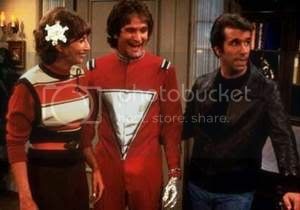 Remember Happy Days, All in the Family, Laverne & Shirley, Three’s Company, Mork and Mindy? Among other shows, these were sort of the Golden Age during which I watched a lot of TV. These were pretty darned funny and played for multiple seasons. My generation, in some ways, grew up with them. Something that they all shared were laugh tracks. In the early days of television, laugh tracks were added to situation comedies to recreate the live theater audience experience. A laugh track, sometimes called “canned laughter,” was placed in the recorded program following a joke or a funny scene to prompt the home viewer to… yep, laugh. I do wonder about the psychological influence of these insertions. Do laugh tracks make the viewer think the moment is funnier than it actually is? Do they cover up lame writing? Do they make you feel more certain about your sense of humor because a crowd is laughing with you? Or, have the studios so “dumbed down” our ability to appreciate comedy that we have to be told when there is a moment that we should have found to be funny? As the present TV lineup is heavy on forensics, police/legal dramas, sci-fi, reality cauldrons, or “I Wanna Be a Star” competitions, there are precious few opportunities for laughs. The Big Bang Theory makes up for that. I normally don’t do this, I hope you’ll understand. But for the purposes of this blog, I counted the laugh tracks in their most recent episode, “The Justice League Recombination,” admittedly a pretty funny episode. I’d say the following statistics are accurate +/- 2 per segment. Further analysis is demanded. Just how funny is this? One laugh per 8.42465753 seconds! Where else are you going to find that kind of comedic value? You shouldn’t be able to watch this show and not find something that’s funny! And, with a minimum investment of time. It took me an episode or two to warm to this show, but, yeah, now I look forward to it each week. But with all this preoccupation on the viewer side, it’s interesting to see how this impacts the actors, who have to be that funny and that fast, whether by dialogue or animations. And then, the practiced crew has to anticipate a laugh track before continuing on with each scene. Yeah, give it a try. It’s not the same episode and probably not as funny, but I’ll take what I can find. You be the judge. Where’s the humor? Believe it or not, I seem to have laughed more without the laugh track than I do with it. Without the laughter it helps me draw on the awkwardness that is felt in real life, and in relating to that, I find it funnier.